With the DP 500 CS Instruments has combined next generation measurement technology with state-of the art user interface design. The experienced user knows that dew point measurement also requires the measurement of line pressure, since dew point is pressure dependent. 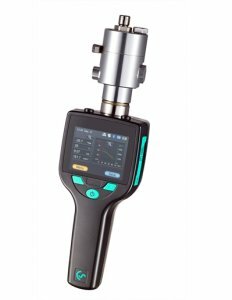 With the DP 500 the line pressure is measured in combination with the dew point, so the user can be confident that the calculation is accurate and free from human error. 1. Similar to modern smart phones, state of the art graphical user interface with touch screen functions for ease of operation. card can be removed for fast transfer of the recorded information to your PC, or alternatively the information can be transferred or read via USB or Bluetooth®. values can be stored as well for report generation in your office. connection to the compressed air system and immediate measurements. Wide range of applications in Compressed Air, Compressed Gas, Vacuum System, low pressure and unpressurized conditions, e. g.